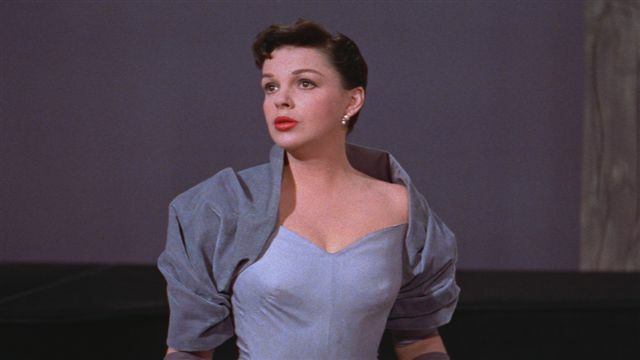 A STAR IS BORN, the 1954 comeback triumph for Judy Garland is— to its preceding 1937 and especially its subsequent 1976 versions— what Dom Perignon is to Cooks. Restored to 176 minutes of dramatic glory in CinemaScope and Technicolor, it’s a long haul that could have at least one lengthy musical number cut out, but so much is so good that editing carp is just a minor sticking point. Just go get a drink during the number you’d exclude—as long as it isn’t “The Man That Got Away”. Sensitively directed by George Cukor, the photography of period Los Angeles, the superbly lit art direction and overall rich detail of the production design are top studio gifts, with Warner’s lavishing $5,000,000 to give the fine Moss Hart screenplay its best package. A big hit (#10 for the year), it was nominated for six Oscars—Actress and Actor, Art Direction, Costume Design, Music Score and Song, but came up empty-handed, with the loss of Garland to Grace Kelly in The Country Girl a bone to pick forever after with legions of Garland fans. Grace was good, but Judy put everything she had into this: she’s remarkable. Worn to a frazzle by MGM tyranny, substance abuse, marital and family woes, Garland looks older than her 32 years, but her nightmarish personal drama invests her acting with such a heightened degree of conviction that sheer talent overwhelms transitory conventional glamour. Oh, yeah, she can sing, too. Her crushing disappointment at losing the Oscar (she was considered a shoo-in) didn’t help her fragile psyche and contributed to keeping her off the big screen for seven years before another critically acclaimed part in Judgement at Nuremberg. James Mason likewise gives a career-high turn as the ill-fated Norman Maine. That walk into the ocean is one for books. Mason was riding high that year, with this and the smash crowd-pleaser 20,000 Leagues Under the Sea, plus a fun spin in the goofy Prince Valiant as a chaser. Along with the two stars, the great Jack Carson gets a plum supporting role, and there’s good work from Charles Bickford and Tom Noonan . Among a slew of familiar faces in support look for a quick bit with an unbilled Strother Martin as a mailman. 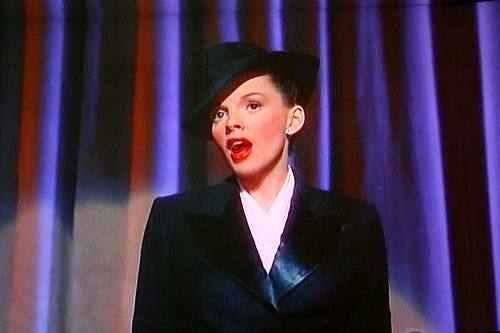 I’m not a raging Judy Garland fan (maybe ‘raging’ is an indelicate choice), I always just kind of ‘liked’ her as opposed to the feverish veneration her glee club bestows, but she’s pretty hard to top as a show-biz trouper extraordinaire. Mason is terrific. A great movie!